The Pyramex development team is always looking for room for improvement in terms of design concepts. Data collected from different elements in life, new and innovative technology, and the creative minds of our staff have all contributed to our leading position in the safety eyewear industry. Based on 20 years of experience in the safety eyewear market, Pyramex is excited to introduce the peak of safety and style to the Australasian market including safety glasses, specialty glasses and safety goggles. 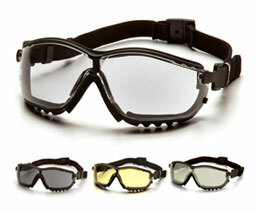 Pyramex V2G Safety Glasses and V2G XP Safety Goggles combine high safety standards with practical solutions and style. The V2G range are designed for high impact applications and now come with the new H2X Lens technology that blocks out fog, mist, sweat and steam. The Pyramex V2G range has the additional option of optical inserts that fit inside the V2G frame and allows for an optical lens to be used without any viewing obstruction making them ideal for applications where users require high quality safety eyewear protection with prescription glasses. - The V2G lens and frame are vented to increase air flow. - The lens provides 99% protection from harmful UV-A and UV-B rays. - Foam padding forms a perfect seal to keep out dust and airborne particles. - Interchangeable temples/headband included with each pair of V2G. The V2G is available in multiple lens colours to suit ay work environment and application and the V2G is certified to AS/NZ 1337 Standards. The Entire Pyramex Range is available through Elliotts.